We have made impressive and extensive updates to both our Natural and Business Themes. We have rebuilt them from the ground up, using our new Seed Theme framework. 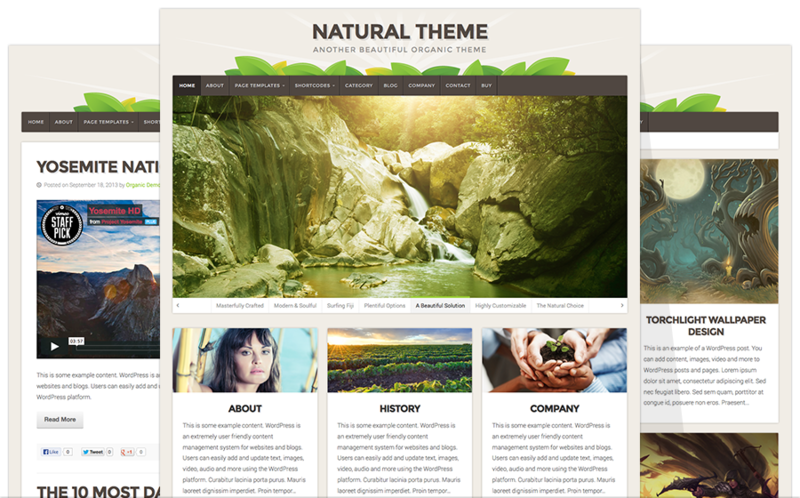 The latest version of the Natural Theme features several upgrades including a responsive framework, retina optimized design, font icons, shortcodes, woocommerce compatibility and much more. We have breathed new life in to the theme with an updated earthy, natural design that still retains a clean, modern and professional appearance. It’s an excellent solution for nature related and inspired businesses. Whether you’re selling herbal supplements or offering sailboat charters, the Natural Theme is sure to meet your needs. 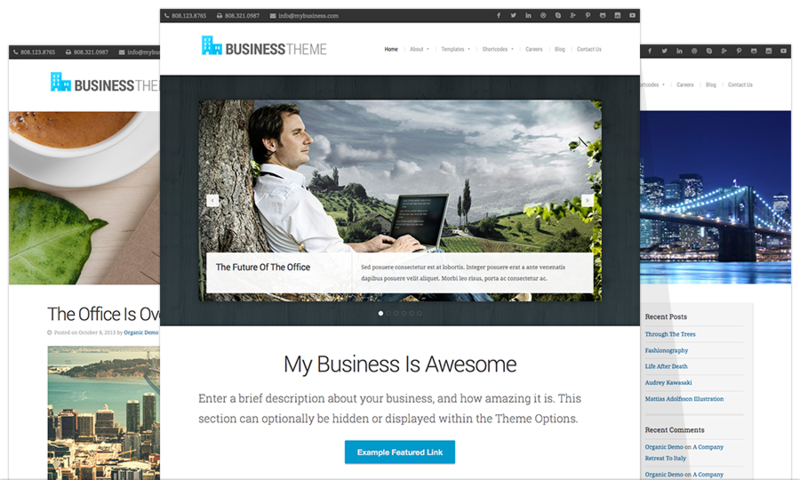 The new Business Theme features the same awesome upgrades as the Natural Theme — and more! The design has been improved drastically. The previous design is but a faint memory lingering within the layout of the new theme, and we think that’s for the best. In addition to the improved design, responsive framework, retina optimization, shortcode integration and more — the Business Theme features custom post types for showcasing team members, job listings and client projects. It’s everything you need in a business website, wrapped up into a clean and corporate package. For an entire website solution, don’t forget to try our Auto Install form to purchase the Natural or Business Theme with 3 months FREE hosting using the promo code “INSTACOOL”. Learn more here. 1) Do I really need the options framework plugin? Options framework give me an activation error. 2) Do you have a list of shortcodes we can use to customize the theme? 3) Can I add text over the slider image as you have in the demo if so how I don’t want to install it I have too much content on the site already? 1) No. Options Framework is bundled with the theme. in SEED, Can the color be changed in menu bar? Buy changed to register and pay? In NATURAL, is it possible to use our own graphic in place of existing leaves? (lovely as they are). Could calendar dates link to program descriptions? Can “buy” page be changed to regiter/pay page? Can other templates use gradient color background like seed has? Can all organic templates include calendar with links? Can columns change page to page or need to be consistent throughout site. Can “buy” be changed to accommodate “register for program/pay”. Thanks for your help!! In homestretch to deciding. i like the natural theme, it’s very suitable for a travel blog and it looks elegant. one question though, if i buy the theme am i free to edit it like changing the colors to suit my needs? I really like the business theme. Do you have any plans to offer this as a premium theme through wordpress.com? It’s a possibility: at the moment we’re working on converting the Collective Theme. i am looking to purchase a theme asap. i am having a hard time deciding which is the best fit for our business (resort). is it possible to change themes after purchasing, or is the price specific to the one theme you choose at time of purchase? We generally don’t exchange themes after purchase. If you have any pre-purchase questions, feel free to send them to [email protected]. Hi, I purchased the original Natural theme in 2012 and now need to get the upgrade please. Finding the right size for the home page slider is difficult, hoping the latest version has this type of information inside the theme options which would save a LOT of time in searching for help. The Business theme is wonderful! How do I re-arrange the people in the “featured team” section? I apparently put us all in backward to what the theme wanted to do. Plus, when we add new team members, I will want them in a specific order. Thanks in advance! You can use a plugin such as https://wordpress.org/plugins/post-types-order/ to rearrange your custom posts easily. Otherwise you would need to manually edit the date to re-arrange them or change the query parameters in the template. For more help, please direct your questions to our support forum: http://organicthemes.com/support. We’ll be glad to help you there! I had purchased NaturalTheme a while ago which as worked wonderfully till now, just had one question – the Google webmaster tool says there are “mobile usability issues” for all the pages. Do you know how to workaround this or is this theme not supported for mobile? Try toggling the theme’s mobile layout option. If the issue persists, then please direct your question to our support forum: http://organicthemes.com/support.